Having recently attended the annual American Art Therapy Association Conference, I am reminded of how important it is to stay connected with those that restore and empower you. Reconnecting with colleagues brought new energy, new ideas and much positive emotion. Knowing who our people are and feeling a sense of belonging is an important part of being human. 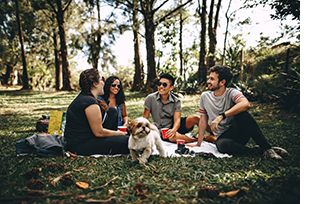 At Jefferson Oaks Behavioral Health, group therapy acts as a microcosm of the real world and provides a safe space to connect and be heard. Depression and anxiety often leads to feelings of isolation and the sense of being the “only one.” It takes courage to be in the company of strangers, but because so many are in treatment for similar reasons, the feeling of strangeness or discomfort quickly dissipates and feelings of acceptance and relief begin to surface. Jefferson Oaks Behavioral Health approaches therapy within the framework of treating the WHOLE person. That is why we work with talented clinicians with extensive training in cognitive behavioral therapy, acceptance commitment therapy, mindfulness, art therapy, solution focused therapy, addiction and more. Our clients receive exposure to many different treatment options and clinicians to help keep them engaged, challenged and constantly learning. The treatment at Jefferson Oaks is intense but rich with resources. We have our clients for a limited amount of time, so it is our mission to make every moment with us count. As our clients become more stable and gain more insight about what brought them to treatment, they gradually begin the process of returning to their outside groups (friends, family, work, etc) with a renewed sense of purpose and greater understanding of the roles and relationships that sustain and enrich them. If you would like to know more about us, feel free to connect with us here, or call to schedule a tour.